This is the fifth guide I've ever created and I wanted to start with a short introduction about myself and the hero featured in this guide, Mortred, the Phantom Assassin. Alright, enough information about myself, let's go back to Phantom Assassin! She's one of the most popular heroes in the game since she's relatively easy to play and thanks to her ability to deal great amounts of physical damage. Phantom Assassin has a very well-rounded skill set that grants her a slow, mobility, evasion and one of the strongest critical strikes in the game. Even though she's all about physical damage, her burst damage potential is outstanding in comparison to the other physical damage dealers. She's famous for being able to one-shot heroes and for dominating in solo fights, her "clutch crits" some times turning the tables. Thanks to her versatility, she can be played both on the safe lane and on the mid lane since she can adapt and farm safely in most circumstances. Right now in more than 60% of matches she's played on the safe lane with a success rate of 51% while on the mid lane she's played only in approximately 20% of matches with a success rate of 55%. I haven't mentioned the offlane because it's not a lane nor a role that fits her too well, to be more specific she's been played on the offlane in only 13% of matches with a winrate of 49%. However, this is DotA, feel free to be creative and play your own way! When to pick Phantom Assassin? Taking all of the above into consideration, you should pick Phantom Assassin when your team requires a hard carry that is able to deal heavy amounts of physical and burst damage, preferably focused on single targets. As mentioned before, she's all about physical damage meaning she's the strongest against targets with low armor ( Io, Tiny, Huskar). Make sure not to pick her against heroes that naturally have high amounts of armor ( Timbersaw, Dragon Knight, Terrorblade) since they're going to be a pain to take down. Since Phantom Assassin is naturally strong against regular attacks thanks to her passive ability Blur, she's going to be strong against heroes that rely mostly on their regular attacks ( Drow Ranger, Anti-Mage, Sniper). Based on the examples just mentioned, she's also great against heroes who are able to easily escape, since she can continue chasing effectively using her Phantom Strike. Strong physical damage dealer and strong against physical damage dealers, great! Let's not forget that disables and magic damage overall are still a great threat to Phantom Assassin. Make sure to be careful around magic damage dealers and heavy disablers, since they're in most cases going to be focusing you. Some problematic heroes in this case can be Lion, Zeus and Axe. Make sure to keep all of these aspects in mind even since the picking phase! 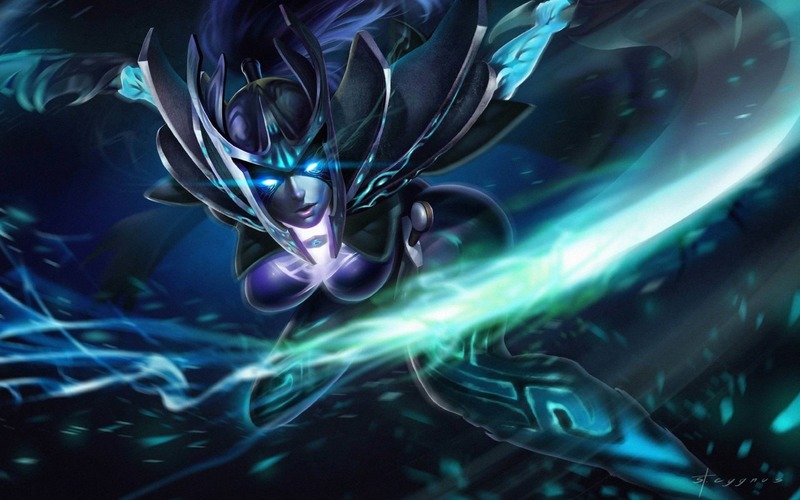 Core heroes like Phantom Assassin tend to get counter picked and focused starting from the early game so they don't snowball and get out of their control. Alright, let's discuss the skill build displayed above. The skill build that we're going to talk about is the most common one among ranked matches, but feel free to make adjustments to your liking. We're going to start by placing a point in each ability till level 4 with priority on Stifling Dagger, since it's the ability that will help you chase, harass and safely farm if required. The ability you want to max out first, as you've probably anticipated, is Stifling Dagger, which is going to be your go-to ability in each encounter. It's important to keep in mind that Stifling Dagger deals damage based on your attack damage plus a base damage value, meaning the stronger you'll get and the more attack damage you'll have, the more dangerous this ability will become, take advantage of that! Moving on, the most effective follow up has proven to be maxing out Phantom Strike. It enables Phantom Assassin to efficiently and effectively chase her foes and jump from one enemy to another in fights to deliver her deadly hits. One quick remark, remember that Phantom Strike can be used on allied units too, so don't hesitate to blink to your teammates whenever you're in danger and you need to retreat. Since Phantom Strike can be used through magic immunity, items like Black King Bar and abilities such as Rage won't be a problem for you. And the ability that makes you a pain to heroes that rely on regular attacks, Blur, is going to be maxed out last since only a point early does more than enough. You're going to have 50% evasion and at level 25 you're going to have 75% evasion, this is really strong and it's going to be almost impossible for the enemies to kill you with regular attacks, they're going to have to invest into items such as Monkey King Bar to only stand a chance against you! And yes, of course, always put a point into your ultimate whenever you have the chance, it's the ability that makes Phantom Assassin a true assassin! Okay, let's move on to Phantom Assassin's talents and which options are the strongest. At level 10 we have to choose between +15 damage and +150 health. Even if Phantom Assassin could use some extra health, I believe the best option here is +15 damage even if it doesn't seem that much. Taking into consideration the damage dealt by Coup of Grace at level 1, the extra +15 damage is going to mean +34.5 extra damage to your critical strike. With each extra level put into your ultimate, this bonus damage granted by your talent will be more and more significant since it scales better than the health bonus. At level 15 we have to pick between +20% cleave and -4 armor corruption. As tempting as the cleave is to speed up our farming, the strongest option here is the -4 armor corruption. It's going to increase your damage output greatly and it's also going to help against heroes that naturally have a lot of armor. Together with Desolator you're going to reduce your target's armor by 10, which makes all of your attacks and your critical strike much threatening. At level 20 we have to pick between 20% lifesteal and double strike Stifling Dagger. I know, it sounds fancy and neat to have double Stifling Dagger, but it's really not that effective and useful. Instead, the lifesteal is going to keep you alive longer in fights thus making you harder to take down. Whenever you're going to critical strike, the lifesteal will apply too and you're going to be greatly healed. For instance, for a critical strike of 1.000 damage you're going to be healed 200 health, that's pretty damn good! And now the final pick, the level 25 talent! We have to pick between +5% Coup de Grace and +25% Blur evasion. As I've previously hinted, we're going to pick the Blur bonus here since it's going to make you almost impossible to kill by regular attacks alone. The 25% chance increase on evasion is much more reliable than the 5% increase on your critical strike. Will speed up your farm and make last hits easier in the early game. Not suggested in the guide, but you can build a Battle Fury using it if you prefer. Also useful against Monkey King and Nature's Prophet. Grants movement speed and increases your attack damage. Make sure to use the phase active ability pretty much at all times! Good stats and some extra mana regeneration and armor! This item will enable you to constantly use your Stifling Dagger without worrying too much about mana usage. Great item that increases your mobility and damage output. Make sure to be careful when using its active ability! It silences and reduces your armor thus making you vulnerable despite the great attack and movement speed bonuses. Extra damage and armor reduction, what could be better for Phantom Assassin? This is one of the most iconic items on Mortred and it should be picked up in every situation! One of the best agility items in the game, the Butterfly offers agility, damage, attack speed and even more evasion for Phantom Assassin. Very strong item that has a win rate of over 75% when picked up by Mortred! The best item to keep enemies under control, you will have the chance to stun your target per attack while you also have the possibility to use the active ability to keep your target stunned. Great pick against heroes like Anti-Mage and Queen of Pain. More stats, attack speed and movement speed! A good pick whenever you need some extra pushing power and when you're against silences. The active ability of Manta Style removes most silences like Orchid Malevolence, strong pick! More damage, armor and health regeneration, everything that Phantom Assassin needs! It will greatly increase your damage output while making you more durable, but even better, it will grant you an active ability that dispels and mutes the target you use it on, very powerful active. If you're having a hard time staying alive in fights, one of the best and most expensive options is Satanic. It will increase your damage, health and life steal greatly. Activating Satanic will grant you 175% life steal, meaning that a critical strike of 1.000 for instance would heal you for 1.750 health, amazing! If you're confident and all your other items are ready, feel brave and pick up a Divine Rapier. It will tremendously increase your damage output and it will make your critical strikes one shot almost everyone. Be careful and sure of this pick up, because losing it might turn the game around against your team! With a win rate of over 75%, the Eye of Skadi is a very strong item that greatly boosts your stats, health and mana. Great item when you need more survivability and some extra way to slow your enemies. In the early game, no matter if you're choosing to go mid or safe lane, your main objective is to farm as much as possible and to survive. If you're going to get killed, you're going to lose a lot of time when you could've been farming and getting experience, or simply gaining passive gold from staying alive. It's a very important aspect to stay alive even if you're not able to greatly farm or gain experience, because the passive gold in this patch is quick and you can recover in the forest later on if needed. If you're having a hard time, try to stay safe and farm using your Stifling Dagger. Time your Stifling Dagger with your allied creeps attacks, getting the right timing is important since you won't want to be using your mana on missing last hits. Be careful, practice, do your best and farm them all! Since you got both a slow and a mean of getting to your enemies, you can play aggressive if you have a support to do so. If your enemy laner is getting out of position, call on to your support and try to setup a kill. Use Stifling Dagger to slow your target and deal some nice starting damage and attack as much as possible. Once your target starts getting away, use your Phantom Strike to get close in order to catch up and finish off the target. In case the scenario is otherwise and you're getting chased, don't forget that you can use Phantom Strike as a way to retreat since you can use it to blink to your allied creeps and heroes. Since you're going to have one point in Blur starting with level 4, you're going to be able to efficiently trade attacks with the enemy laner since you're going to surely hit and deal damage while they are most probably going to miss a good amount of their attacks. Use this to your advantage and harass as much as possible! Once you've got your Ring of Aquila, if you're not having problems farming, you can use your Stifling Dagger to chip off your target slowly until they are low enough for you to jump in with Phantom Strike and get the kill. Once you've reached level 6 and you got a point in Coup de Grace, the real fun begins! You're going to be dealing great amounts of damage so early in the game whenever a critical strike happens that any single target is going to be in danger when engaged by you. Make sure to take advantage of your great physical damage when dealing with heroes with low armor. Most of the time in the early stages you're going to focus on the lonely supports that are easy to take down, but beware since they're going to be the ones with the disables, don't blink in a fight if you're not sure you can get the kill and fall back safely! Since Phantom Assassin is the strongest in the early stages due to her enemies not having much armor, it is best to get your core items quickly, especially your Desolator which will help you melt your enemies. Having a tough start and not farming efficiently will reduce your potential and make the rest of the game more difficult, be careful and remember not to die! As the game progresses and you get more items, you're going to be the number one threat to your enemies and they'll do everything that they can to take you down before you're able to deal your damage. Make sure to play smart and not give your enemies free kills. Stay around your team and don't be the one to go in first when the enemies are together. Your strongest ability is to take down enemies quickly so make sure in later fights to focus the most high value hero of your enemy team. In some cases, it's better to take down quickly the hero that deals the most damage out of the enemy team, but some times a simple support can be the highest threat due to their abilities ( Winter Wyvern for her Winter's Curse, for instance). I hope you've enjoyed my fifth guide and I'll make sure to keep this guide updated as soon as the patches are released. Good luck and have fun criting!